In this clear VIS image, taken by the NASA - Mars Odyssey Orbiter on August, 24h, 2015, and during its 60.743rd orbit around the Red Planet, we can see a small part of the Trough called Olympica Fossae. It is located on the large Lava Plains existing between the Martian Volcanoes known as Alba Mons and Olympus Mons. Olympica Fossae, as we wrote hereabove, is a Trough (---> a deep and long Crack of the Surface) found in the Tharsis Quadrangle of Mars and centered at 25� North Latitude and 114,1� West Longitude; it is about 420 Km (such as about 260,82 miles) long and it was so named after a so-called "Classic Albedo Feature". A few Planetary Scientists - but be are well aware that there is no actual proof supporting this theory so far - suggested that some parts of the Olympica Fossae have been (are) both Outflow Channels, as well as Lava Channels, routing first Molten Rocks and then Catastrophic Outbursts (---> Floods) of Water, of course at different times in Mars' Geological History. 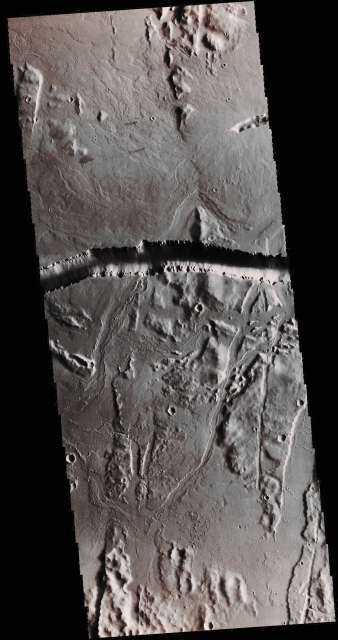 This image (which is an Original Mars Odyssey Orbiter b/w and Map-Projected frame published on the NASA - Planetary Photojournal with the ID n. PIA 20071) has been additionally processed, magnified to aid the visibility of the details, extra-contrast enhanced and sharpened, Gamma corrected and then colorized in Absolute Natural Colors (such as the colors that a normal human eye would actually perceive if someone were onboard the NASA - Mars Odyssey Orbiter and then looked down, towards the Surface of Mars), by using an original technique created - and, in time, dramatically improved - by the Lunar Explorer Italia Team.